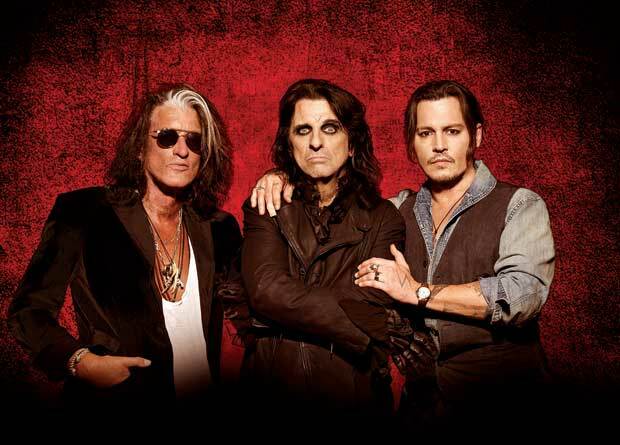 Could there be a more perfect name for the unholy triumvirate of Alice Cooper, Johnny Depp and Aerosmith guitarist Joe Perry than Hollywood Vampires? Named after the legendary drinking club formed by Cooper in the 70s with a membership that included Keith Moon, John Lennon, John Belushi and Marc Bolan (among others). Unlike other members, Cooper is a survivor who faced down his demons and quit drinking decades ago. This new iteration of the Vamps is a tribute to departed friends and lost heroes. The supporting lineup also harks back to the golden age of rock'n'roll. Openers The Damned were the first punk band to ever release a single and even after all these years 'New Rose' still fizzes with a demented energy. The Gothic glamour of frontman Dave Vanian and the goofy mugging of guitarist Captain Sensible still forms the core of the punk pioneers: a delicious contrast that brings 'Smash it Up', 'Love Song' and creepy crooner 'Eloise' to manic life. The Darkness do what The Darkness do. You can't fault frontman Justin Hawkins' commitment to pomp rock pantomime, and 'I Believe in a Thing Called Love' is an undeniably thumping crowd-pleaser. The vast majority of Hollywood Vampire's set is made up of classic 70s covers. Essentially a pub rock supergroup that grew monstrously out of control. They started with a few informal shows, recorded an album in 2015 and now head on their first world. With thunder and lightning it's an intro Hammer Horror would be proud of. They open with a couple of original numbers – 'I Want My Now' and 'Raise the Dead' – that are faithfully evocative of the era. Starting slow with 'I Got a Line on You' (Spirit) and '7 and 7 Is' (Love) before Cooper's ode to lost drinking buddies 'My Dead Drunk Friends' (that includes the lines: 'So let's have another for all of my brothers, who drank until they died / I'm raising my glass and tossing it back, but I can't remember why'). It's a rollicking rock'n'roll sea shanty tinged with sadness as images of Hendrix, Lemmy, Jon Bonham and many more play out on the big screens. It's a slightly surreal experience watching two rock icons and a genuine A-lister jamming on stage. Surely the world's best and most ridiculously over qualified covers band. This isn't about breaking new ground but revelling in the past, celebrating the power of music to bring people together. A fitting hard rocking eulogy to Cooper, Perry and Depp's fallen comrades.